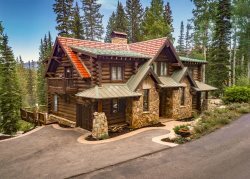 Limber Pine Lodge is a private, high-altitude home situated at the bottom of Brighton Ski Resort's slopes and only a mile from Solitude Ski Resort. Live the VIP life here, at elevation! The cabin was designed and furnished as a private get-away and exclusive vacation rental. A luxurious, mountain home with breathtaking views of Silver Lake in summer that can be seen from every room in the house and easy ski access in winter to two of Utah's highest elevation resorts. The wilderness awaits you with hiking trails, fishing, mountain biking, snowshoeing, skiing, snowboarding and cross-country skiing within view of the house. This vacation rental offers all the upscale comforts and privacy you need in the heart of the Wasatch Mountains.